Booniverse » Blog Archive » Posting! 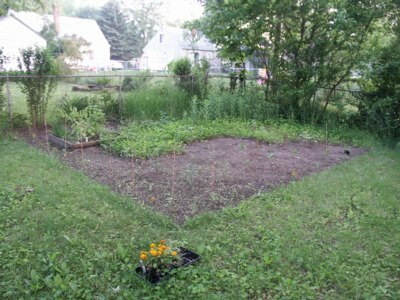 There is the new garden look as of this past weekend. I’ve done no gardening at all this week so far because I’ve been suffering from malaise. I think I’m fighting a bug of sorts because all week I’ve been irritable and cranky and zonked by the end of the work day. Thus, we get home, I have a bowl of cereal for dinner and I go to bed. Today my ear was all hurty when I woke up and I almost started a parade I was that happy to have a specific malady. I hate general malaise because I feel off but I can’t point to anything specific. Hurty ear? That’s a real thing. Look! Hurty ear! Gotta go take a nap! Hey! You know what else is in the Q news? ORIGINS! It’s in two weeks and I’m not even half way prepared. ARGH! I did get buttons stompered this past weekend but I didn’t have all of them handy so there is more stompering yet to do. There is also buttoning that has to be done which hasn’t yet. On the plus side, I have 2 and a half Norbert tentacles sewn up and LunarGeography is working on head number 3. I’m hoping to have all the Norbert arms/tentacles done this week and the heads done and washed by Monday. Then it’s attach, stuff and glue on the eye bit and wala! Done. Really, the sewing part is the most time consuming as the Norberts are some of the fastest assembled puppets I’ve made yet. This is good…TWO WEEKS!!!! ARRRGH! Ooooo! Also good news this: Mumses is willing to trade out cars so we can take her Outback to Origins. Yay Mumses! We’re carpooling with the BadGardens this year (take THAT gas man!!) but we have a bug (yow) and they have some sort of small car as well (yow) so we were trying to figure out how to get all of us plus the Smtihee stuff down to Columbus. Now we don’t have to play Smithee Tetris cuz Mumses’s vehicle should hold us and our stuff. We also should be able to go shopping in A2 for our Origins food fixings like we always do. When we had car space issues the plan was to shop for food in Columbus since it’s still cheaper to bring your own sammich fixings than it is to eat out at the convention places. Stickin it to the convention man, four years running! Now we can go back to our old familiar plan of bringing along the foods. That about brings me current with the Q news. Stay tuned tomorrow for a very special Isaak themed entry. 2007: Here are my six foot sunflowers which aren’t yet six feet and being munched on. Damned bug munching things. 2006: I had the chance to stop by the condo and snagged some crazy rosebush cuttings with which I’m hoping to propagate little crazy rosebushlets. 2005: Taking a break from posting. 2004: For two years apparently. 2003: Tonight is TheMan’s long time bestest bud from the 5th grade’s birthday and we are all going over to the Real Seafood Company so Rob can get Lobster. This entry was posted on Thursday, June 12th, 2008 at 11:52 pm	and is filed under General Bloggery. You can follow any responses to this entry through the RSS 2.0 feed. You can leave a response, or trackback from your own site.